Grodan Stonewool (rockwool) is made from molten rock spun into cotton candy-like fibers and then compressed into cubes, blocks, or slabs. Where other rockwool brand manufacturers cut all sizes from one batch of wool, Grodan is unique by making different types of fibers. The purpose is to support the requirement of the plant in the different plant stages. Grodan has a tremendous capacity for absorbing nutrient solution while retaining plenty of oxygen for rapid plant growth. Grodan comes in graduated sizes. Seedlings started in cubes are easily transferred to blocks and then onto slabs, if desired. Seedlings or cuttings started in the Grodan cubes can also be transplanted into more traditional planters and growing mediums. 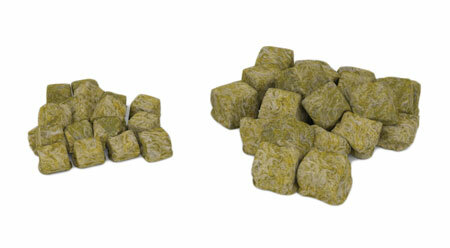 (br)(br) Grodan Grow-Cubes - The product consists of small stonewool croutons about the size of a fingernail. When you use this potting mix the miniature cubes stack on top of each other and air pockets are created throughout the pot. 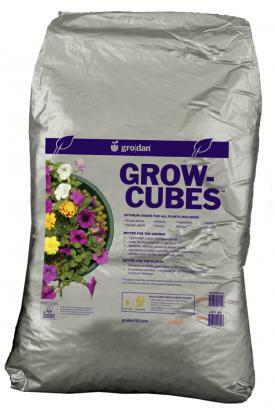 Grow-Cubes are difficult to overwater if the container has good drainage. The Grow-Cubes are a lightweight alternative to your regular potting mix. You can use Grow-Cubes in any size pot and in many different growing systems, such as ebb & flow, top watering, or just with a watering can. Good results have been seen even with continuous watering. Grow-Cubes do not need to be changed, as they last for the life of your plant. If you are new to hydroponics, then this is the product you should choose. Complete with package instructions, Grow-Cubes are easy to use and reasonably priced.